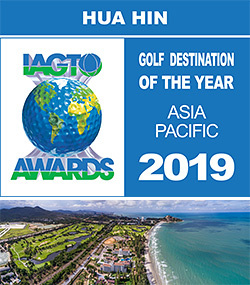 Bangkok - Hua Hin has won the International Association of Golf Tour Operators (IAGTO)’s Award for Golf Destination of the Year for Asia 2019. It is the second time that Hua Hin has won the award in this category since 2014, and the fifth time it has gone to either a region of Thailand or the country itself. Thailand also won IAGTO’s Emerging Golf Destination of the Year Award for 2006, the second time in only five years. The Award will be presented on 18 October, 2018, during the International Golf Travel Mart (IGTM) 2018 to be held in Ljubljana, Slovenia. The Award carries enormous weight because it is voted for by specialist golf tour operators, who are members of IAGTO. Held annually since 1998, the International Golf Travel Market (IGTM) is attended by over 500 golf tourism suppliers who join 400+ pre-qualified buyers and 100 international press for four days of pre-scheduled appointments, networking, and industry and trend updates. The participating golf tourism professionals are estimated to collectively control 80% of the world’s outbound golf tourism market. This year, TAT will participate in the IGTM for the ninth year. TAT has reserved 4 square metres of space to negotiate business with buyers from around the world. It will also provide information on tourism information and create awareness in the golf market, which is in line with the Sports Tourism (Golf) promotion plan. TAT will also promote its annual Thailand Golf Travel Mart (TGTM). Golfing is a high-growth, niche market that draws upper-middle class income earners from all around the world. Thailand boasts over 200 top-quality golf courses nationwide, attracting golfers from all around the world to play and attend international tournaments. Located about 200 kilometres south of Bangkok, Hua Hin is the country’s oldest beach resort. The summer retreat of Thailand's Royal Family for more than 90 years, Hua Hin has long been a popular destination among Thais. Indeed, it was where Thailand's first golf course – Royal Hua Hin Golf Club – was built in 1924. A number of world-class golf courses, hotels and resorts, health and spa facilities have put Hua Hin even more into the international spotlight.